Can the Bucks Break Away From the Herd? The case for Milwaukee's ascension in the East starts with this simple, but controversial point: Giannis Antetokounmpo is a Center. Or at least he should be. Statistically, the case is easy to make. Last season, Giannis averaged 26.9 ppg, 10.0 rpg, 4.8 apg, and 1.4 bpg. When you sort for those benchmarks using Basketball Reference's Player Season Finder tool, remove the assists and you get 26 qualifying seasons [Note: blocks did not become an official statistic until '73-'74, so we're almost certainly missing a slew of Wilt seasons]: David Robinson (2X), Shaq (7X), Kareem (3X), Bob McAdoo (3X), Hakeem Olajuwon (3X), Moses Malone (2X), Anthony Davis (2X), Patrick Ewing (once), Giannis (once), Chris Webber (once), and DeMarcus Cousins (once). Add in the assists, and the list whittles down to just Kareem's '75-'76 campaign and Giannis last year-- rarefied air indeed. What sticks out about these lists? With the exception of Webber (who played the vast majority of his minutes at PF in '00-'01), it's all centers. [Yes, even Davis -- B-R estimates AD played right around 58% of his total minutes at center over the two seasons in question. So there.] Giannis sticks out like a sore thumb (a really, really long sore thumb) because his beaver-like playmaking responsibilities on the perimeter don't jibe with the rest of the "traditional" big men populating the list. Also, Giannis plays almost all of his minutes with a "true" center in the lineup; B-R estimates he only played 7% of his minutes last year at the 5, and only 2% for his career. The question is: why? Based on the stats, he can obviously do all of the things those Hall of Fame big men could do -- block shots, rebound, score inside, and protect the rim -- while also making plays for himself and his teammates like a lead guard or wing. Is there any evidence of a real defensive downside to surrounding him with guards and wings, and could it possibly outweigh how completely unstoppable the team would be at the offensive end? The argument against it isn't rebounding. The Bucks already sucked on the glass (last in the league in total rebounding in '17-'18). While not ideal of course, perhaps punting further on what is already a weakness costs less than the gains achieved by potentially going from good to great on offense. Also, the big men they added in free agency (Brook Lopez and Ersan Ilyasova) are not known as strong rebounders, so they appear committed to leaning into the philosophy anyway. It isn't like the personnel they have been using at the 5 are any great shakes. John Henson is a fine complementary player, but he's overpaid at $10 million per season for two more years and shouldn't be averaging 26 minutes a game, as he did last season. Thon Maker is only 21 years old, but he regressed in his second season and remains a complete liability at the offensive end of the floor. He offers theoretical floor spacing at the 5, but only shot 29.8% from 3 last season, and his floor game is basically non-existent (6.5 rebounds and 1.3 assists per 36 minutes in '17-'18). He is young and should still improve, but questions are starting to creep in about whether his ceiling is really anywhere near as high as it was claimed to be when he was drafted, or if we were all just sold a bill of YouTube goods. Both Henson and Maker project to lose minutes to Lopez anyway (and possibly sophomore D.J. Wilson as well, depending on his health and development), but it's worth asking whether some of those minutes would be better off being distributed to wing players in small lineups. Since it was employed so infrequently by the previous coaching regimes, there is very little reliable lineup data to use as proof of concept for this "surround Giannis with long-armed shooters" hypothesis, but it still should get a serious look. Depending how you feel about Kawhi Leonard (and his bizarre laugh), it's not crazy to argue the Bucks made the biggest personnel upgrade in the East this summer by bringing in head coach Mike Budenholzer to replace the execrable combination of Jason Kidd and Joe Prunty. The Bucks were 25th in the league in 3-point attempts last season, and Coach Bud -- whose Hawks ranked in the top-7 in 3-point attempts in 4 of his 5 seasons in Atlanta -- is undoubtedly going to want to spread the floor out more to unlock the outside shooting and give Giannis more room to operate on the interior. Lopez should help, as he's proven to be a willing floor spacer over the last two seasons (5.2 and 4.4 3PA per game, respectively), and he could end up slotting into the 5 spot in the Bucks' closing lineup this year. He hasn't been terribly efficient with those chances, however, shooting only 34.5% from 3 over those two seasons with the Nets and Lakers, and while he isn't an actively bad defender, his lack of lateral agility makes any lineup with him less versatile defensively, and again, does nothing to address their rebounding woes. Pairing Giannis with Ilyasova in the frontcourt may be the best of both worlds, as Ilyasova rates better than Lopez as both an outside shooter (36.6% from 3 in his career) and a rebounder, while also being a bit more switchable defensively. 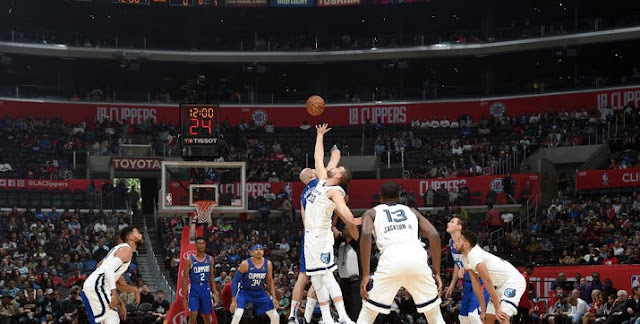 They brought in more shooting by signing Pat Connaughton and drafting NCAA Championship-game hero Donte DiVincenzo, and Sterling Brown, who shot 35.2% from deep on 4.2 attempts per 36 minutes in his rookie season, could see more run this year. If Maker's shot improves, he could see a bump in minutes as well, relegating Henson's retrograde skill set to mop-up duty. Tony Snell will continue to get minutes as long as he keeps shooting over 40% from deep, but the rest of his game is so underdeveloped, it wouldn't surprise me to see him shift into a reduced role. Tweaking the personnel to fit better around Giannis, along with the upgrade at head coach, should be worth a significant jump in wins, but their ability to truly vault into contention may be limited by the poor roster decisions -- and the resulting lack of financial flexibility -- of the previous front office. Hitting a grand slam with Giannis has allowed the team to paper over its numerous swings and misses elsewhere on the roster. It's hard to give them much flak for how the Jabari Parker situation played out -- he was the correct pick at the time -- but to get next-to-nothing out of the #2 overall pick during his rookie deal and then "lose" him for nothing is a bitter pill to swallow, and the opportunity cost of the miss indelibly changes the trajectory of the franchise. They are well under the projected luxury tax going into the season, but paying the combination of Tony Snell, John Henson, and Matthew Dellavedova over $30 million total for each of the next two seasons (Snell also has a player option for '20-'21) is far from ideal. Three years/$21 million is probably a little steep for Ersan Ilyasova, based on what other free agents were fetching in this summer's chilly market. His $7M salary in '20-'21 is non-guaranteed, but if he plays out the entire contract, he'll be 34 at its conclusion and probably at the end of his NBA rope. The extension Khris Middleton signed in 2015 has turned into a tremendous bargain, but he has a player option next year which he is almost certain to decline, making him an unrestricted free agent who will draw plenty of interest in a more cap space-flush league-wide environment. Eric Bledsoe could be a potential bounce-back candidate after his total no-show in the playoffs against Boston last year, but he will also be a free agent after this season, so if the team wants to keep its core together beyond this year, it will have to be prepared to add more long-term money to the books, and probably go into the tax for '19-'20 -- a hard sell for a small market team perpetually ranking in the bottom third of the league in attendance. Henson, Snell, and Delly all have very tradeable salary figures, but they are worth more to Milwaukee than they would be to a potential trade partner; if anything, the Bucks would probably have to attach a draft pick sweetener to get off any one of the deals. Looming over all of it is the specter of Giannis exercising his "pre-agency" if the team doesn't take a big step forward this season and make winning roster moves next offseason. He has three years remaining on his deal, which means next summer he'll be right in the sweet spot to exert his organizational leverage, if he so chooses. We've seen nothing in Giannis' personality or actions to this point to indicate he is displeased with Milwaukee, but if the last few years have taught us anything, it's that things can change quickly when it comes to superstars. Just twelve months ago, would anyone have believed mild-mannered Kawhi Leonard would hold the venerated Spurs' organization hostage for an entire season before publicly demanding a trade? Nothing is off the table, and the Bucks' front office had better act accordingly. The organization is very much at a crossroads this season. 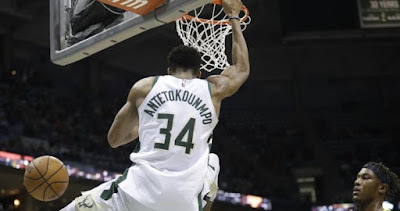 With an array of shooters to flank the Greek Freak's continued ascendance and a capable, adaptable head coach to finally deploy them properly, the Bucks could be in position to rise up out of the East's middle class, with the likes of Washington, Indiana, and Miami, if we want to be generous. Milwaukee proved to be a worthy adversary for the banged-up Celtics in last year's playoffs, but if they are to ascend to the level of this year's Boston squad (which, you may remember, I suspect is going to be a juggernaut), along with the improved rosters of Toronto and Philadelphia, they'll need Coach Bud to summon all of his tactical brilliance to unlock the long, switch-y defensive monster for which fans have long been clamoring. Fortunately for him, he may have the league's most devastating trump card: Hall of Fame Point-Center Giannis Antetokounmpo. Now he just needs to play it.